"Mood is everything, and who wants to dine in bright light? 60 watts for the dining room,"Barbara Barry says. "I want it bright when reading, so 75 to 100 watts for the living room. It's nice to have options — if you don't have dimmers, then have some variety from 40 to 100 watts, so you can change the mood for the occasion. The bathroom needs overhead as well as side lighting. Keep the overhead to 75 watts, with 60 watts on each side. The best lighting is at eye level, not overhead, which creates shadows. And the best light is diffused light from a white or off-white lampshade." "Use recessed lighting sparingly. Too many fixtures turn your ceiling into Swiss cheese! "Anthony Baratta says. And be mindful of where you place that kind of lighting. "Limit overhead can lighting to functional areas such as bathrooms and laundry rooms — the light is too harsh and flat for your living areas," Timothy Corrigan says. "Lighting is everything. It creates atmosphere, drama, and intrigue in a room. The easiest way to accomplish this is with a dimmer switch. I always use dimmers, even in the powder room!" Martyn Lawrence Bullard says. "We locate light switches about 36" above the floor. That way they stay out of the way of the art on our walls. We put switches about 1½" to 2" off the side of the door casing for the same reason," Gil Shafer says. Your closet needs attention, too. "Some good, solid recessed lighting is clearly going to help to distinguish this pair of black trousers, from that pair of black trousers!" Scot Meacham Wood says. 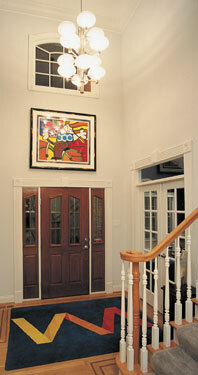 "We will also regularly add a gallery fixture across the header of built-in closets as a secondary light source. You're regularly working with matching colors and textures while getting dressed each morning, so having good lighting is a requirement." Inspired by the smart and stylish collection of bedheads that hit The Home, we’ve compiled three looks that showcase their versatility: Luxe Haven, Scandi Lines, and Modern Feminine. Each one invites, relaxes, and impresses in its own unique way, starting with a classic bedhead. Which look do you love? A peacock blue bedhead sets the tone for this striking look that embraces everyday elegance. Dress the bed with a mix of sumptuous textiles and confident patterns such as cosy knits and floral motifs. Royal blue and glamorous gold touches are soothed with grey and cream shades for a look that won’t date. TIP: Peacock blue is a surprisingly easy colour to combine with others. Pair it with beige, white, metallic, and vibrant shades such as pops of hot pink. Play all the right angles with this look that offsets a dark coloured bedhead with dazzling geometrics. 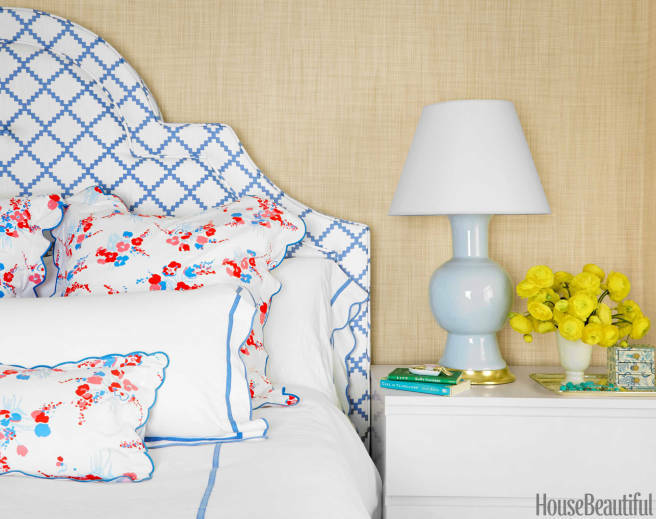 It’s a bright and playful kick for a bedroom that likes its plumped-up comfort with fun! Make the fashion-forward look timeless with the addition of classic shades in grey and cream. Add a few simple curves such as a round side table or circle rug to ground your angled look. A confident mix of pattern brings a cosy look to this modern bedroom. The key to each motif working here is the colour combination used throughout. The bedhead, throw cushion, rug, and quilt cover complement one another in a palette of warm sunshine gold and moody blues, while a touch of neutrals and provincial side table softens the bold patterns. Make sure that the floor lamp is at least 68 inches tall; this way whether standing or sitting the shade will hide the bulb and keep it from looking tacky. With correct placement, light can be evenly distributed throughout any room. Whether there's a need to brighten up a random space with overall brightness there is a floor lamp for that. On the flip side, one may be searching for some mood lighting, or focused lighting for a favorite reading spot. When it comes to ambient lighting one will want to choose an upward facing globe style, for directional lighting near a desk or to accent a space a lamp with a shade is best, and it should be opaque. It's also best to be sure a lamp is proportionate to the room it's being placed in, or the furniture it will be close to. Being visually appealing is just as important as having ample light. There are several types of floor lamp, and knowing the names and styles before shopping will make things much easier. Below are the various styles for consideration. 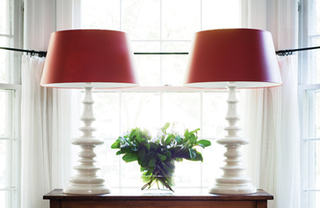 Console - This is the basic style, however they are typically just referred to as floor lamps and not console. They will have a round base and feature a cloth or globe shade. Torchiere - More lavishly presented, the torchiere is usually around six-foot tall and features a bowl-shaped shade that casts light upward. Since the light reflects off of the ceiling this is a perfect choice for indirect lighting. Arc - The Arc floor lamp features a bent pole making it perfect for a reading space. Place them by a single chair or couch for the best effect. Swing Arm - The Swing Arm features a triple-joint that allows the user to direct light wherever they please be it vertically or horizontally. Track Tree- Three or more sockets branch off of a single pole on the track tree floor lamp. The sockets are housed in interesting globes or shades in various colors and styles. This adds a very fun element to any room. Tray - Tray floor lamps feature the classic console style with a built in tray for anyone that wants to save floor space and forego an end table. Floor lamps are extremely easy to care for. Most just require a regular dusting, and modern bulbs last so long that one will be surprised when it's time to replace them. Metal, glass and wooden pendant lights are all popular choices. They come in mini, multi, drum, up light and down light versions. Explore these different styles below. Mini Pendant Lights - As the tiniest version these can illuminate work spaces and kitchen islands well. They're not thought of as ambient lighting, but can reinvent the feeling within a space more than any other options. They act as a focal point, or a lighting work of art as they are super stylish and can be quite chic. Anyone will find that they command attention and create vigor. Multi Pendant Lights - Multi Light Pendants are fixtures that feature multiple hanging lights, all connected to a centralized point. They give a comparable look to individuals only they're better for a room with one overhead electrical point for connecting. They are sensational, striking and versatile. 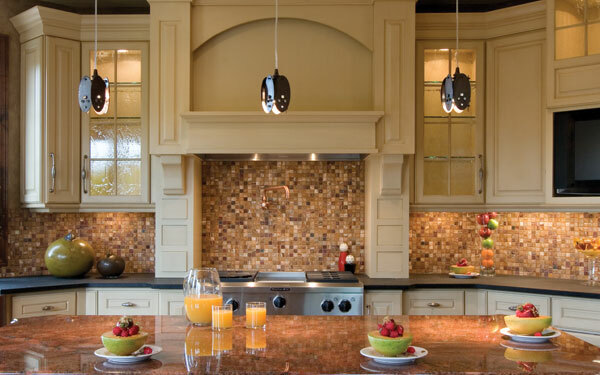 Use glass or wooden pendant lights over a table of any kind, work areas or even kitchen islands and counters. Drum Pendant Lights - Drum Pendants are light fixtures featuring a cylindrical drum-style shade. These types work seamlessly in every room. Choose a basic white cloth shade or a dark shade with metal features. There are also patterned shades to add fun, as well as double or triple concentric styles that have gained in popularity as of late. Anyone that wants to add some style can easily do so with a drum, pendant light. Up Light Pendants - Up Light Pendants are fixtures that shine light upward. This type is great for basic lighting, as the light shines skyward and can enlarge a space with ease. One will find that ceramic, glass or wooden pendant lights in this style make a statement. Down Light Pendants - Down Light Pendants are fixtures that shine direct light downward, and they are best for work lighting to completely illuminate any task at hand. Correct placement of glass or wooden pendant lights is essential to creating a decorative and task driven appeal. Common places for them are over a dining table, kitchen island, billiard table, hallway or bathroom however there really is no limit to their placement. 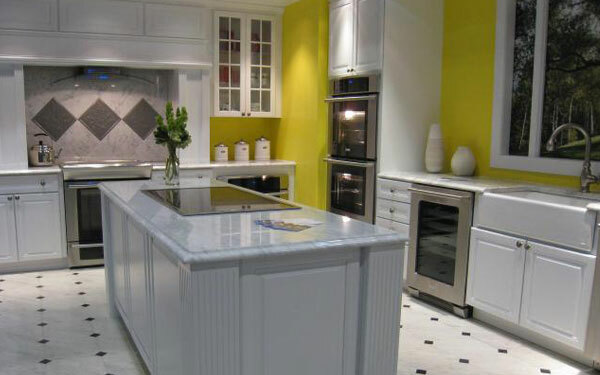 In kitchens over an island, they are usually for tasks, but can also augment design elements. They should be thirty to forty inches above the surface, and definitely not get in the way of a cooktop if one is present. However, they should be low enough to help with reading that favorite recipe. In the dining room, these lights can replace the classic chandelier of days past to play with the appearance and style completely. The lights should be thirty to thirty-six inches above the table, and possibly higher for a larger table. A lower placed light will create a cozy atmosphere, but beware of having it so low that it shines into diners' eyes. 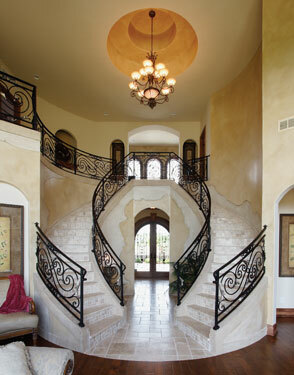 In hallways and other areas, it adds grace and striking style. The light and shadows cast by them is astounding. Hang them in an even row down the length of a hall for a classic look, or hang one by itself or in a cluster in a foyer. The length should fall between twelve and sixteen inches for a typical 8-foot ceiling, and eighteen to twenty-four for taller ceilings. It's important to remember that no one is limited to using glass, ceramic and wooden pendant lights among others only for the places discussed. One should always be open to their imagination when it comes to decorating their home. Expect a wide range of lighting choices from the premier custom lighting company in Victoria Australia. For over 40 years they've been serving the community with innovative light fixtures from top markets throughout Europe and America. As a company that shows interest in their customer desires, these professionals are knowledgeable about all the latest trends in lighting. You'll never be disappointed with the fine selection of traditional, modern, lavish and custom lighting pieces offered to you. Make Designers of Light your first stop whenever you need lighting of any kind and invest in a quality fixture that you'll love for years. If there is any type of lighting out there that is similar to a delicate yet beautiful piece of jewellery, it is vintage lighting. It holds the power to transform even the plainest of rooms into a glamorous and nostalgic heaven. It doesn’t matter if your personal taste leans toward classic mid-century table lamps or wall sconces, because vintage light fixtures give off a rich, old-era vibe that changes the overall atmosphere of a room. If your grandparents ever lived in one of those old Victorian town houses, then surely you must be familiar with the copper and bras lighting fixtures they had installed. Part of the charm of those beautiful houses lied in that very lighting. Imagine recreating that lighting in your own home. Not only will you bring back some of the beauty of the old age back, but you will give your home a sense of age, of maturity. You house will instantly seem older, as if it’s been there for centuries. This will make anyone who walks into your home instantly feel a sense of respect for you and your house. Vintage lighting and industrial lighting are two sides of the same coin. While the term „vintage” can make you think of this type of lighting as restrictive and limiting, in truth, it is anything but that. Since they come in many styles, you can easily bring back the quirky vibe of the 50’s or the pompous mood of the Victorian age. It all depends on your preference. Can you say the same about modern light fixtures? No, you can’t. 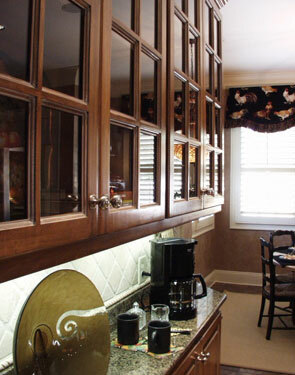 Moving on to specifics, the kitchen and the dining room look very good in vintage lighting. Especially if said vintage light fixtures are contrasting the minimalistic or modern look of the room in question. 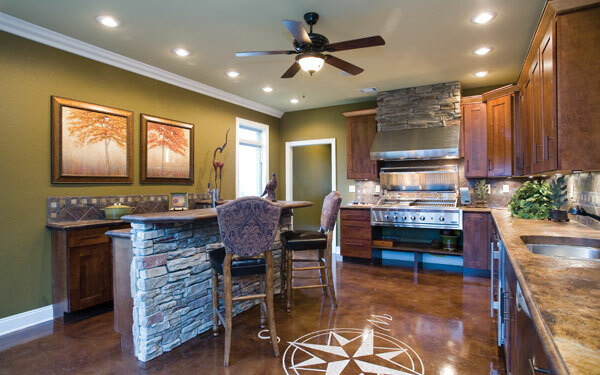 The metallic shine of the copper combined with the modern and sleek design of your family kitchen makes for a visually appealing room. You see, vintage lighting or industrial lighting fixtures come in many shapes and sizes – not to mention colours and styles. This allows for an insane amount of design possibilities that you can take advantage of in order to add some magic to your home. From exposed filaments, to dome-like copper pendant lights, you can find virtually anything you want in vintage light world. When so many possibilities are available to you, it falls onto you to create wonderful design. All it takes is a little imagination on your behalf and you can easily create or recreate your dream home. Who doesn’t like having lights outside? Especially vintage copper fixtures to delicately light up those hot summer nights. Just think about those natural looking, warm vintage lights illuminating your backyard while you lay under the starry sky sipping refreshments. Regardless if you live in a suburb or in the big city, the chances are you do have a little outdoor space such as a balcony or – best case scenario- your very own backyard. You can decorate your outdoor space either with tiny and dim pendant lights for a magical atmosphere or install miniature street lamps in your backyard for decent lighting. It’s your call! When visiting a local store or browsing online, be sure to ask which of their fixtures are made for outdoor use and then let the creative juices flow from there. Here are some popular ideas for decorative outdoor garden lighting to get going! Hanging lights outside are so versatile that they don't have to just be over a table on a porch. If one is willing, there are a great many ways to make them work as decorative outdoor garden lighting. In a seating area - Come together with friends and family in comfort and create a space where there can be drinks served, cards and other games played and much more. From trees - Though this may be tricky it can create a very romantic space outdoors with the right hanging light fixtures. On a balcony - Illuminate the balcony so it can be enjoyed in the evening as well. It's the perfect place for a glass of wine or cup of coffee. Surrounding a patio- Define the patio or other space by surrounding it with hanging lights. Place them strategically to go all the way around or even just at the corners. From an umbrella - During the day, the umbrella blocks the sunshine; but at night it can illuminate a place to sit and visit with friends and family. By the outdoor fireplace or pit - Though the fire pit gives off a lovely glow the warmth can be extended when hanging, decorative outdoor garden lighting is added. Landscape lights can highlight the areas of the property the owners are most proud of; making them visible after the sun goes down. More importantly they make the area safe so there are no falls from guests or family members. Lampposts - A well placed and stylish lamppost can welcome any visitors to the home and help them see the walkway to the front door. Porch lights - Porch lights not only light up the steps and doorway, but are a fashionable addition to the home. Many attempt to match the style of porch lights and lampposts. Walkways and paths - Be sure walkways and paths are illuminated at night so that outdoor living is safe and also pretty. This makes it easier to get around after dark. In the yard - Various points in the yard can be lit with decorative outdoor garden lighting so that it's easier to navigate and avoid stepping in or on something and becoming injured. Gardens, fountains and ponds - Show off these elements with beautiful lighting so they can be admired at night. Add lighting to a gazebo, archway or other fixture and take a midnight stroll. Swimming areas - Night swimming is spectacular! 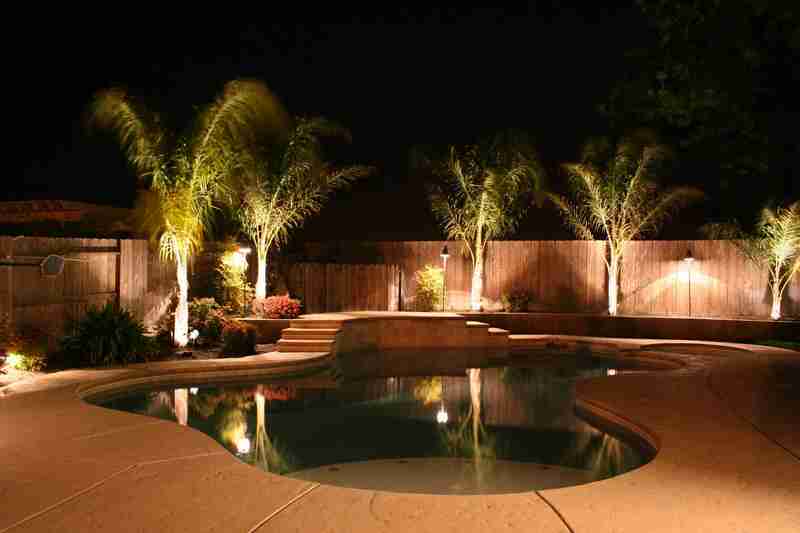 Though there may be lights in the pool itself it is important to keep the surrounding yard and patio lit as well for safety and security, and also to make it feel warmer. There are all styles and sizes of wall and ceiling lights for decorative outdoor garden lighting. Use various styles of lighting on screened in or open porches and patios, place them on walls outside of the garage for playing basketball or safe navigation upon leaving and returning home. Any covered areas can benefit from a ceiling light. Gazebos are more useful when they are accessible after sunset, and both types are perfect for the front porch. Nonetheless, chandeliers can add wonderful ambience to just about any room. They are designed to float in a room as an element of the design. It can serve as a room’s centerpiece without taking over the entire space. Chandeliers can be a great conversation piece, as well as a part of the home that really makes you feel as though you are living in luxury. They are elegant and unparalleled additions and command attention like no other furnishing. There are many points to consider when choosing a chandelier. Size, materials and light emission are crucial when determining the perfect chandelier for a room. Vertical and horizontal sizes are important decisions to make when selecting a chandelier. 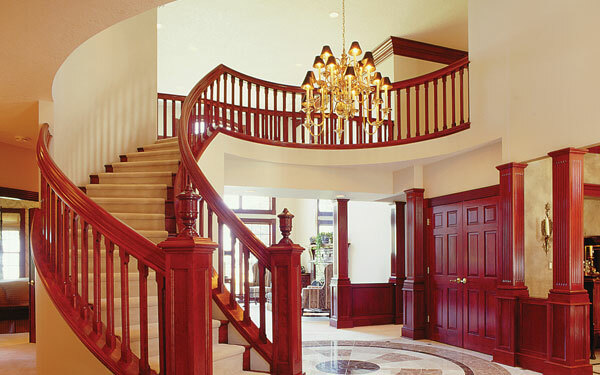 A fixture that is too large may overwhelm the space, however, one too small will appear out of place or insignificant. The design and size of the chandelier will also affect the hanging height. Another way to help determine the proper size chandelier for a room is to add the dimensions together. For example, if your room is 12' by 17', add the 12 plus 17 to get 29. Therefore, a proper size chandelier would be around 29" diameter for that room. The length at which the chandelier should hang depends on the ceiling height of that particular room. The bottom of the fixture should not hang more than 7' from the floor. If windows are present, center the chandelier in the window so it can be seen from the outside. Since a chandelier will be a focus piece in the room, it is vital to choose materials that will enhance the decor of the area. Lavish and visually dazzling light fittings can create the most beautiful kind of lighting. The combination of crystals and candles conjures up all kinds of nostalgic feelings about chandeliers. Crystal and glass fixtures are very popular and represent a romantic sense of wealth. Chandeliers can also come in different metals such as brass, wrought iron, silver and steel. 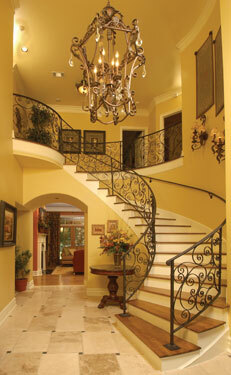 A wrought iron chandelier produces a magnificent appearance. Stone, beads, shell and capiz chandeliers aren’t quite as fancy, but definitely provide a more edgy or whimsical look. Antler chandeliers from elk or deer embody a rustic style and are perfect for log cabins and rustic lodges. For a room with a traditional style, a fixture with more ornamentation and intricate designs will fit best. influential in the decoration scheme of the room. 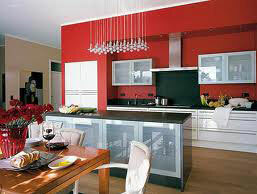 You want your chandelier color to compliment your existing finishes. Brushed bronze, black, silver or even gold can be neutral tones that will match most decorating schemes. If you already have a warm, rich, wood and earth-toned theme, a bronze or gold finished chandelier may work best. A very common spot for a chandelier is often found in the dining room. It is important to make sure that the chandelier is low enough to light up the eating area without interfering with the sight line of the people seated at the table. The general rule is to measure 30" to 36" from the surface of the table to the bottom of the fixture to insure good illumination. Additionally, it should be about 12" narrower than the width of the table so it will not interfere with people’s heads. Often, the best thing to do is hold the fixture over the table and move it up and down until it looks right.